In an elevated position, affording breathtaking views over the highly acclaimed Highlands Reserve golf course and Wellington Woods, sits this outstanding executive, 5 bedroom vacation villa, just minutes from Disney. We seek to appeal to families, who require the highest standards of accommodation at reasonable rates. Please ask us for out huge web site with 100s of photographs and 5 on-line videos showing the house in great detail. We have provided the best entertainment and relaxation opportunities, including 'top of the range' hydrotherapy spa (hot tub) and two excellently stocked games rooms with many, many extras! This magnificent property, enjoying one of the best, oversized plots on Highlands Reserve, offers a beautiful holiday home decorated and equipped to the highest specification. The house is positioned at the end of a cul de sac in a very peaceful, quiet lot with no passing traffic. Games rooms, with Xbox One, Nintendo Wii, table tennis, foosball, pool table, darts etc. West facing heated swimming pool: sun throughout the day from morning through to beautiful sunsets. Heated 'top of the range' 7 seater hydrotherapy spa. Multi channel cable large screen television and VCR / DVD in family room, with further multi channel cable TVs in games room and all bedrooms. Large variety of videos and DVDs. And a variety of other entertainment. 10 min from Greg Norman's champions gate course. Within minutes of dozens of other championship rated golf courses. Please check "all prices" for costs relating to pool heat, hot tub and cleans for stays of 5 days or less. We are a close knit family. Wendy is the Principal of a large College in Merseyside. Joe is a Retired Primary School Headteacher. Our adult children are Kate and Ben. Kate is a doctor in Preston and Chorley Trust. Ben is an Economics Graduate at LSE. Kate is married to Jonny - a teacher from Leyland. The villa really stood out for us. (Literally and metaphorically!) We've had it a long time now - and are delighted and immensely proud of its quality, location and views. 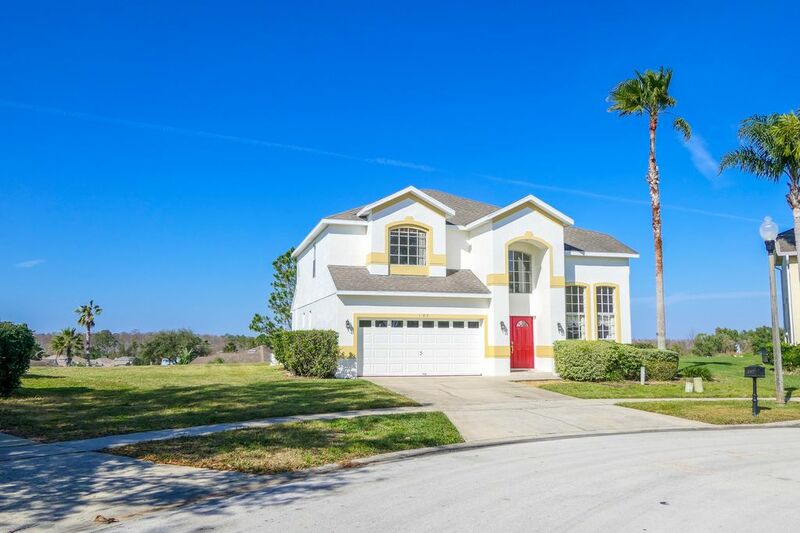 It sits in a prominent and very private position at the top of one of the highest points in Florida looking across the golf course and the panoramic views of Wellington Woods in the distance. Because the plot is so large, it allows the unique combination of privacy (through not being overlooked) and views. This is probably the most private deck in this part of Florida - which is important to us. The villa is aesthetically very pleasing and is laid out extremely well for families sharing the accommodation - so when it became available - we snapped it up!! We have been delighted with the villa ever since and await with great joy our opportunity to "get away from it all" and spend quality time sitting on the pool deck and "chilling out!" We narrowed down to Highlands Reserve since, from the outset, the development gave the impression that it was going to be high calibre and prestigious. It has certainly lived up to that expectation. We hoped that, due to being on a golf course, the area would be highly maintained - and that is exactly what has happened! Highlands Reserve has become a very sought after location for rental villas and justifies its excellent reputation by shrewd management of the houses and environment by owners, the golf course owners and the home owners association. Its a genuinely wonderful place to stay due to its quality - and builds further upon this due to its easy access to the major attractions. Potential guests would, of course, expect us to say "we love it" - but we can say so with great sincerity!! We absolutely love it - its wonderful!! The villa is situated at the end of a cul de sac in one of the most prestigious developments available for short term letting (Highlands Reserve.) Being literally at the end of the cul de sac means that the plot is extra large, fanning out is a wide sweep / arc of land to ensure that the nearest houses are further away than pretty well any other villa in the area. To the rear of the property, the nearest villas are significantly lower in height - making it difficult for them to see "up the hill" further enhancing the privacy. We invite potential guests considering the property to visit the privacy section of our own detailed website - where the issue is dealt with in greater depth. Inside the property, the villa is equipped to very high standards. We basically threw away the "package" furniture - employed an interior design expert and set the villa out beautifully. The layout oozes quality and style - and the combination of a lot of space in terms of square area (for two families for example) combined with "Cathedral Ceilings" really establish a deep sense of space and volume - which we believe is extremely important for guests when, for example, two families are sharing the villa. One's own space is very important - and that can be achieved here. One of the other great "unique selling points" of the villa is the hot tub. Its simply wonderful - and ideal for weary limbs at the end of the busy park type days where legs have done rather more walking than they are used to!!! Its a luxury that no-one should pass up. It heats to a maximum of 104 degrees (optimum is about 102) and really soaks away the aches and pains and invigorates the soul!! Local and USA charges included. All linens provided for your stay. Highlands Reserve is one of the most sought after courses in this part of Florida. Top of the range hydrotherapy spa (hot tub). Hot tub is available for £87 per week Pool heat is available for £130 per week (Recommended October to April - though available all year.) BBQ hire available (min 7 days) £40 per week Outstanding over sized plot overlooking golf course. Very private. A recent $90,000 upgrade to establish this house as truly 'executive.' Games room with an outstanding variety of additional entertainments, including Xbox One, PlayStation 2, (new) Nintendo Wii, table tennis, table football, pool table, table hockey, foosball, darts, boardgames and many others. 2 high quality 'roll away' type beds to allow flexibility of accommodation. West facing pool for morning to (beautiful) sunset sunshine Smoking only allowed on patio. Troon Circle, part of the highly prestigious Highlands Reserve Golf Community is located just off Highway 27, approx. 3 miles south of Highway 192. I4 Junction 5 min south. Disney resorts just 10 - 15 min away. Nearest Supermarket: New Publix just 2 min drive away. A huge array of eating establishments within 5 - 10 min drive. Set at the top one of the highest areas of the state, Highlands Reserve is not your typical Florida golf course. This Par 72 championship design by Mike Dasher gives you tree-lined fairways reminiscent of the Carolinas, open spacious fairways likened to the great Scottish courses, and a bit of old Florida with citrus trees dotting the countryside. Large, fast, undulating greens make this course challenging and fun for all levels of golfers. Conveniently located just minutes from Walt Disney World and all major attractions, Highlands Reserve Golf Club is a Central Florida favourite! Highlands Reserve has been one of 'Golfpac's' most requested courses by golfers worldwide, and customers continually rank its customer service, course conditions, and professional staff as top notch....Course Knowledge: Highlands Reserve is one of Central Florida's brightest new stars on the golf course circuit. The course boasts over 120 feet worth of elevation changes, making it one of the few, hilly courses around. Open fairways and large greens are the signature of Highlands Reserve. Putting is the real challenge here as the double, and sometimes triple-tiered greens can create their share of three-put opportunities. 107 Troon Circle overlooks the short Par 3 12th Hole with panoramic views over the 'links style' course.